dotcommodity: GM's Lutz Demands - "Tear Down This Wall!" GM's Lutz Demands - "Tear Down This Wall!" Detroit comes up with an easy solution:"We should suspend U.S crash-testing requirements in order to allow Detroit to speed our fuel-efficient European models to the U.S. market"
True. But why are US crash-test procedures different here than in Europe? Because, after the oil shocks of the 70's, GM, Chrysler and Ford lobbied for a NHTSA import "wall" to prevent those gas sipping Japanese and European cars from interfering with the American consumers' unfettered patriotic right to buy gas-guzzlers. You might say that Americans have been kept behind a wall, an iron curtain that keeps our vehicle choices very limited. NHTSA regulations were deliberately created to differ from ECE regulations that govern cars in the rest of the world in order to protect the fortunes of GM, Chrysler and Ford. As a result, European Ford and GM now make some of the finest gas sippers there are over there, and there are lots. As detailed in Number of Gas-Sipping Cars Unavailable in US Rises To Well Over 100, by 2007 Europeans had a choice of over 100 cars that get over 45 mpg, while we were stuck with fewer and fewer models capable of 35 mpg or more till Smarts and Minicoopers hurdled the wall this Spring. “We also would like a 3-year moratorium on certain U.S. front- and side-impact crash test regulations,” Lutz says, but don't be alarmed by that. Europe has a lower deathrate than the US, under the EU rules, and these will be safer than what you are driving now. How ironic that now Big Auto is realizing that the climate-virtuous vehicles they make over there are only prevented from being sold here by their own once lobbied-for legislation. I hope he has a good strong lobby for this new and much better idea to standardize their production worldwide, to a better standard. I'm with you, Mr. Lutz. 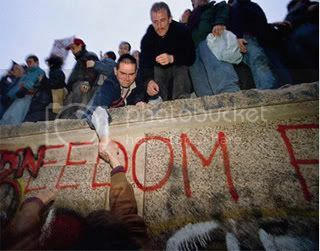 Lets tear down this wall!